Rajasthan, a treasure trove of Indian history, offers you to explore several historical monuments, architectural structures, tradition, culture and natural beauty of places. If you want to experience top offbeat tourist attractions near Jodhpur, you will get many Heritage Resorts in Rajasthan to stay. We at Rawla Narlai Heritage Resort are one of the most famous Boutique Hotels in Rajasthan. We at Rawla Narlai are a paradisiacal resort and one of the most popular Resorts near Jodhpur. It is the right place to enjoy your holidays and explore the beauty of several offbeat tourist destinations. Some of these offbeat tourist destinations are as follows. Narlai is located at the center of the Aravalli Hills and also midway between Udaipur and Jodhpur. We at Rawla Narlai Heritage Resort are one of the best palace hotels in Pali, Rajasthan. By choosing our resort, you will get the experience of the Royal culture and splendor of Rajasthani architectural structure. You can make adventurous jeep safari to get chance for spotting leopards, deer, chital etc. You can enjoy trekking which is one of the greatest tourist attractions of Narlai. You can get the options for places to visit in Jodhpur such as Lord Shiva Temple and Adinath Temple. Jalore is one of the best places to visit in Rajasthan. It offers the rustic beauty and architectural structures of Rajasthan like Jalore Fort. It connects many religious places to visit in Jodhpur. You can visit Rajasthan famous places such as Chamunda Devi Temple, Sirey Mandir, and Sundha Mata Temple. You can also visit the famous Malik Shah’s Mosque withing Jalore Fort. Nagur is the perfect offbeat place to visit in India. You will get the opportunities to enjoy the largest salt lake in India, Sambar Lake. You can visit Nagur Fort which is one of the most renowned historical places in Rajasthan. Deepak Mahal of Nagur is important among Rajasthan destinations. The other popular attractions of Nagur are Jain Glass Temple, Amar Singh’s Cenotaph and Tarkeen Darhah. These are also renowned places to visit in Rajasthan. Rawla Narlai Heritage Resort was one a magnificent hunting lodge of famous and brave Jodhpur Royal family. Presently, it has been converted into a luxurious and gorgeous heritage resort including all kinds of modern amenities. It is the perfect place to experience the Royal hospitality with delicious traditional cuisine of Rajasthan. We at Rawla Narlai have several options and you can choose the option according to your requirement. 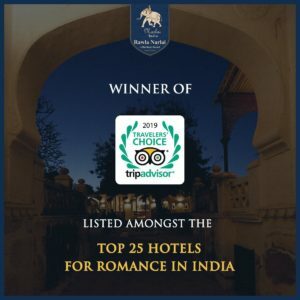 So, if you want to make a remarkable tour to Rajasthan, Rawla Narlai Heritage Resort can be the best option to stay and to enjoy the best places in Rajasthan.